“May the Buddha Sasana Glow!” (Budhu Sasuna Babalewa! ), I remember seeing this message written on the back of a lorry when I was a boy. That was more than fifty years ago, back in Colombo. Those words fascinated me then. I recall watching the Vesak pandals with my parents. Those magnificent colour lights flashing, changing, moving, together with the radiant artistic illustrations of Jathaka stories had me entranced. The mesmerising Vesak pandal at the Borella junction was perhaps a glowing example of the Buddha Sasana. That was my childhood impression. I was aware that the Sri Lankan government had a minister for the Buddha Sasana. That position has been in existence since the 1990s irrespective of the side in power. However, I had not given much consideration to what the ‘Buddha Sasana’ should represent until recently. It was only after I commenced the translation of Sathyodaya to English at the request of the Walpola Rahula Institute, that I had a truth awakening. The original Sinhala version of this book was written about 85 years ago by Ven. Walpola Rahula. 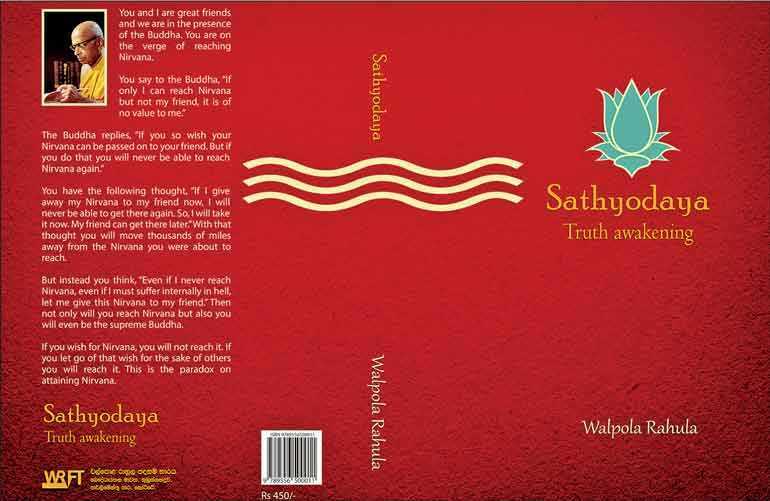 The English version of Sathyodaya (Truth Awakening) was launched on March 29, 2019 by the Walpola Rahula Foundation Trust. What is the Buddha Sasana? In Sathyodaya, Ven. Rahula clarifies any misconception about the Buddha Sasana. Now could this be a view point expressed Verable Rahula rather than what is stated the Tripitaka? With the Theravada Tripitaka now declared as a National Heritage item, this is an aspect that requires further exploration. On one occasion the Buddha’s disciple and attendant Venerable Ananda asked the Buddha whether the fundamental instructions to bhikkhus given by the preceding Buddhas were the same as those of the Buddha himself. The Buddha’s response is included in the Dhammapada (Verse 183). These words of the Buddha could very well serve as the mission statement of Sri Lanka’s Buddha Sasana Ministry. The Sasana of a Buddha is clearly his teaching or doctrine. Ven. Rahula was simply restating and explaining the Buddha’s words. In fact he was providing an ‘Anu-sasana’ to the Sathyodaya readers. Sathyodaya goes on to provide an illuminating discussion on who should be accountable for protecting the Buddha Sasana. 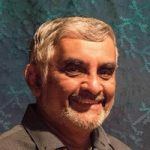 Is it the gods, the Sangha or the lay followers? Ven. Rahula argues against the widely accepted notion that ‘the Buddha Sasana will survive only if there are robe-wearers’. He affirms that if the continued existence of the Buddha’s teaching is dependent on type of clothing such as a robe, then that teaching must indeed be of very low value. Sathyodaya stresses that “the Buddha’s teaching is universal and for the benefit of all beings”. As the Buddha did not limit his doctrine to specific group of people the unwholesome actions of anyone would be a stain against his legacy. Then Ven. Rahula astutely points out that “even if a Christian or a Muslim performs a wrongful deed, it is still a black mark against the legacy of the Buddha”. The ultimate message is clear. There should not be a separation of us and them. Everyone in the society which includes the Sangha, the lay followers and persons of other religious identities, have a role play in the protection of the Buddha Sasana by living righteously. Ven. Rahula also alludes to a flawed accountability model in our society that has hindered the Buddha Sasana. The lay community appears to have handed over the contract of safeguarding the Buddha Sasana to the Bhikkhus. The necessary food, drink, clothing and accommodation for the monastics is provided by the lay community. By doing that they feel that they have fulfilled their obligation. After all they have very busy lives. So surely, they cannot be expected to keep precepts and develop virtuous qualities. Let the Bhikkhus do their bit and protect the Sasana. Extending this line of thought, let the Theravada Tripitaka be declared as a national heritage. Let the Bhikkhus come up with a pristine version of the scriptures for the future generations. Let the imposters in robes be identified. However, the most significant component, the need to practice the teaching, appears to have been excluded from this model. The Buddha stood firmly against the discriminating of persons based on caste. The Vasala Sutta (Discourse on Outcastes) states: “Not by birth is one an outcaste; not by birth is one a brahman. By deed one becomes an outcaste, by deed one becomes an brahman.” Sathyodaya cites the stories of Suneetha, the street sweeper and Upali the barber who were ordained by the Buddha regardless of their origins. Perhaps the time has come for the high priests who are custodians of the Theravada Tripitaka to step up to protect our national heritage. Let us also heed to the valuable counsel provided by Ven. Dhammananda in the introduction to Sathyodaya – Truth Awakening. He highlights that “the intention of this book is not to turn you into a fierce critic. As a bowl of dirty water ultimately becomes clean when clean water is continuously poured into it; learn to be a patient and compassionate mediator.” We need to cultivate the habit of changing our perspective based on proper understanding and gradually induct others into this process. I will wait until I have read your review of this book “Sathyodaya – Truth Awakening” to make my opinion “public”. Humans have always exploited fellow ‘flock’ of humans. The founders of religions attempted to rescue the ‘flock’ from this injustice. The clergy (Hindu, Buddhist, Christian, Islam and others) have reintroduced the misogynistic and other traditions back to the gullible ‘flock’. The Niranjan Selvadurai’s translation of “Ven. Rahula’s Sathyodaya – Truth Awakening” must be directed to our leaders who manipulate the ‘flock’. Niranjan Selvadurai , what you have written is true only if there is anything left of our Sasanaya to glow. The “babalenna sasanaya” (Shining sasanaya) became the “gaathanaya” (assassination) when it was allowed to mix with politics. Poor Ven. Walpola Rahula must be turning in his grave. The last sentence in Poojya Ven. Rahula’s “Sathyodaya” refers to the ethics that rest with society that values in an honour system. That is why he refers to a “Samajaya” (Soceity) of “shista sumpanna” (ethos and to be civilized). Is our’s a society civilized enough to respect the teachings of the Lord Buddha , Thripitaka, Clergy (Sanga) and the lay person? Has our Sanga earned any respect to glow? While agreeing with what you say let’s be thankful to Niranjan and The W R Institute for the English translation for broader understanding of the dharma. Even Venerable Rahula is not a Sangha Member who achieved any level of enlightenment. I do now know who made the Mistake. Keeping Food, Flowers, drinks, incense and any thing else, in Veneration or the specific Buddhist word is Srhadda and not Faith or belief or fear, in front of Buddha Statue has lot of meaning. Buddha never ate Food after the time, So once the Sun is on the downside, it is OK to eat those or use those Water or drinks. but, offerings without any srhadda is just a useless practice. I know four Writers made the same mistake or mis interpretation. It is not like kneeling in front of the Cross or to one direction. I will not make an adequate comment here. Just point out that if every Sinhalese in this country came across this book, the immediate reaction of 99%, including me, would be incredulity that a man with a name like Niranjan Sevadurai has written such a book. More seeming contradictions! An author, not just with a Muslim name, but whom we know to be a learned Muslim. And a comment there from Rajan Hoole! That alone ought to be food for thought for so many foolish Sinhalese who imagine that the Dhamma belongs to us. Has he written the book or just translated the original? The essence of all spiritual teachings is the same. It is these original spiritual teachings which have branded and made into organized religions, each taking the position that only their way leads to the ultimate Truth or God or whatever. If only the essence of all these teachings are given importance and not the teacher nor the book, then there would be only one religion, that of love and humanity. Seperate organized religions would not survive without these externalities such as rituals and formalities. If only the essence of all spiritual teachings is given prominence instead of organized religions claiming ownership of these teachings, then there would no need for tags such as “Buddha sasana” or “Christ sasana” or “Islamic sasana etc. Then only spiritual sasana will exist. Sathyodaya was originally written in Sinhala by Ven. Walpola Rahula during the 1930s. It was not translated to English during his life time. The Walpola Rahula Institute was of the view that the contents of the book were extremely relevant to the society today and that the thoughts expressed in the book need to be made available to a wider English reader base across the world. My role was to come-up with an English version of Sathyoday to meet this objective. All that has been said here transports me back to the view I had of Buddhism half a century ago, before any discussion of Buddhism had racial and political overtones. I made what I said was an “inadequate” comment, and this isn’t going t be much better. Your article merely evokes a sense of nostalgia for a time when one could think and say things without searching for words that are “politically correct”. A few generations back all my ancestors would, no doubt, have understood more of what is said here than I do. You see, for as long as I can remember, all my relatives were labelled “Christians”. One was pushed into a situation where one had to say, when confronted with any moral, eschatological, epistemological or social issue (I didn’t use such learned words, of course), “My religion says . . .”. How ridiculous that is, but that’s where we still are. I’m sure that such a response is the very antithesis of what poor Gautama or Rahula meant. Niranjan, do you think that either (or both?) of those two intelligent men would have had a sense of humour? I think that both would have told me, with a tolerant smile, that this is the problem with the human condition. On this website, what is discussed is usually of a political nature. When I chose this slightly racist-sounding handle I did so to assert that in terms of cultural and social heritage, I’d be labelled so; Christianity means little to me. How much sense this comment of mine makes I don’t know, but thanks, Niranjan for the article. I can very well relate to the sense of nostalgia for the relaxed ‘stand and stare’ style we grew up with. I am sure both the Buddha and Ven. Rahula both did have a sense of humour. When killer Angullimala shouted at the Buddha to stop running, The Buddha replied ‘I have stopped, it is you who are still running’. Now that is both wisdom and humour all in one and under pressure! I was not comfortable with labels. Most who new me well did not try to label me. Those who did not know me well were not sure how to label me. I think for all of us the human label would do. Thank you from appreciating the article. I’m in Arugam Bay, brought here by one of my pupils who has serious doubts about my sanity. Unfortunately, you may see my article on the Maldivian elections too late to comment. Yes, we are probably very different persons, but I think that we both understand that humanism stands above all these divisions that we create for ourselves. However, to be consistent we ought to be all vegans. There are very few such in our country, and I’m not one such. I’m a self confessed “pau karaya. My vegan friends are Prof Mahinda Palihawadana and Dr Rajan Hoole.